On clean dry surface lay out tortillas. 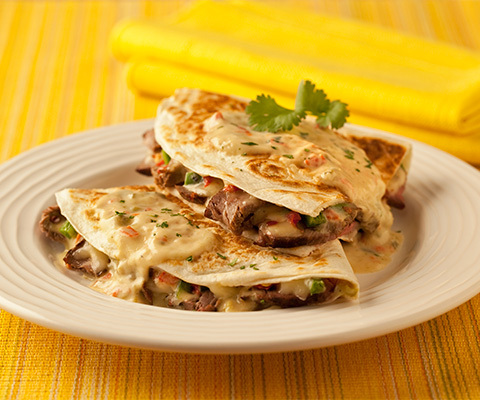 On one half of each tortilla evenly distribute steak, cheese, jalapenos and red pepper flakes. Add 1/4 cup pasta sauce to each tortilla, then fold over to make a half circle. Pre-heat a large non-stick skillet; cook quesadillas for 3 minutes on each side or until cheese is melted. While quesadillas cook; heat remaining sauce.